Avocado trees (Persea spp.) grow outdoors in tropical climates, but Georgia gardeners can grow dwarf avocado trees, taking advantage of the long growing season and hot weather to leave container trees outdoors through much of the year. 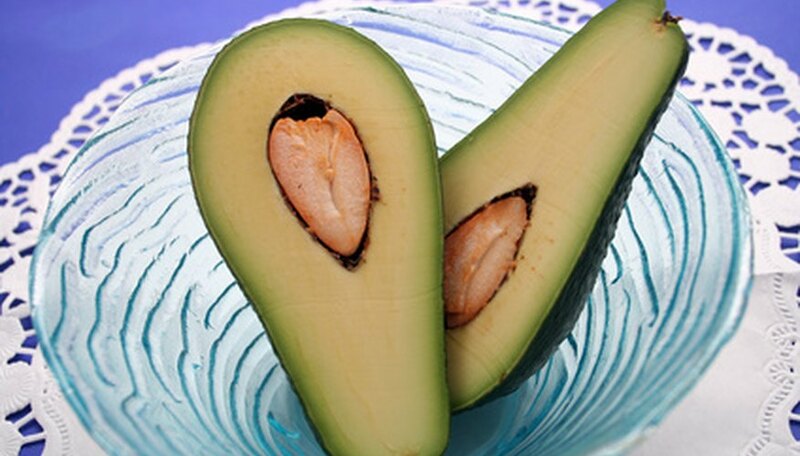 Avocados lend themselves well to salads, Mexican cooking and sandwiches, adding flavor and texture to most dishes. The tree is not cold hardy, which is why only container trees are recommended for Georgia. The trees don't need cross-pollination, so you can harvest avocados with only one tree. Select a dwarf avocado tree that grows well in containers. "The Augusta Chronicle" suggests planting Gwen, Whitsell or Wurtz. Fill a 5-gallon container halfway with a mixture of equal parts balanced potting soil and topsoil. Use a container with drainage holes so your avocado tree doesn't develop root rot. Pull the dwarf avocado from its container and loosen the root ball with your hands. Unwind tangled roots before setting the tree in the container at the same depth as it was planted in the soil. Backfill the container with soil to finish planting. Water the tree until liquid flows from the drainage holes at the bottom of the container. Set the tree outdoors from the spring through fall. Bring your avocado indoors when temperatures fall below 40 degrees F. Set it inside in a southern or south-facing window where it receives ample light. Trees need full sun to develop avocado fruit. Water your avocado tree until the soil becomes saturated. Then let the container dry out before watering again. Do not fertilize your avocado tree during the first year. Beginning in the second year, apply a balanced fertilizer such as 10-10-10, four times a year. Follow the dosage range on the fertilizer package, which suggests an amount based on the tree trunk's diameter in inches. Scatter the fertilizer on the container then water the container to work it in. Prune avocado trees to maintain the size and remove unhealthy wood. Prune off suckers growing along the avocado tree trunk and from old pruning cuts. Remove crossed branches and downward-growing branches. Thin out the canopy to promote air circulation by removing thin limbs. Harvest avocados when the fruit ripens, anywhere from six to 18 months, depending on the type of avocado. Bright green avocado trees develop a yellow tinge on the skin when it's time to harvest, while dark green varieties turn nearly black. Clip off ready avocados with scissors then let the fruit sit out until it softens.